On the 30th May Spacebits will be launching a high altitude balloon into the stratosphere. The balloon will travel about 100,000 feet before exploding. After it explodes an attached probe carrying the balloon's payload will return to Earth on a parachute. The payload on board the high altitude balloon includes some quite expensive recording equipment so the Spacebits team are quite keen on recovering the probe. Therefore Spacebits will be using tracking the balloon and probe live. For the occasion they have developed a live dashboard website that will show the probe's position live on a map. The dashboard will also show live a number of gauges that will be displaying the balloon's altitude, pressure and temperature. If you can't wait for the launch the map is currently running as a demo of what you might see. The launch itself will be at 11AM UTC/GMT+1 tomorrow (30th May). 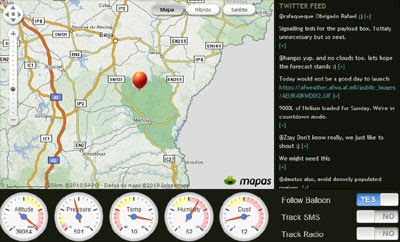 It's not Google Maps, though, it's SAPO Maps, a mapping/GIS platform from SAPO, the biggest Webportal in Portugal. So it is, I think my eyesight is going.